Your occasion deserves to be special and memorable. When choosing a handcrafted wedding invitation, you are sure to show a reflection of yourself and your style to your guests. Our goal is to create a lasting first impression with our unique hand-crafted products. Let our unique handmade invitations be the first glimpse as to what your guests will expect at your beautiful event to come. Unlike stock invitations, each of your items will be made individually by hand through a delicate process - we take pride in the final results of our orders. At This & That Creations your options are unlimited! We encourage you to share in our experience - with our skills and your dreams an unforgettable event can unfold. Perhaps your event is inspired by nature and rustic details, or influenced with an extravagantly lavish appeal, our superior, uncompromised products will meet your needs giving your guests a glance at the special day to come. Keep in mind that your unique wedding invitation can be custom designed by using our vast array of the finest cardstocks, lustrous handmade papers, luminous vellums, ribbons and embellishments, to reflect your distinctively creative personality. When choosing one of our hand crafted invitations and accessories each product will be given its own personal style with our hand-tied ribbons, hand-torn paper edges and hand-cut specialty sized papers. And should you choose a product using one of our exquisite, one-of-a-kind brads or eyelets, each will be placed and affixed one by one, by hand. Remember that when giving a custom designed wedding invitation, or hand-crafted product, you are giving a small gift of yourself. We understand how stressful this process can be and we will leave you confident knowing your wedding, or special occasion, will be as important and as much a priority to us as it is to you - we've been there...we know! We will ensure your satisfaction from our one on one customer service to our concrete and precise invites. But don't stop there!!! We have endless ideas to coordinate the style or theme of your wedding with programs, table numbers, place cards, favors, seating charts and maps, menus, wish cards, bridal showers invitations, bachelor and bachelorette party invitations, and thank you cards. And if you like to plan ahead, don't forget save-the-dates!!! What better way to give your guests a heads up on the event of the year with a save the date magnet, card or calendar card. Our save-the-date magnets have become a huge success in their versatility of placement being at home on the refrigerator or on the office filing cabinet...we can promise you - they won't forget!!! 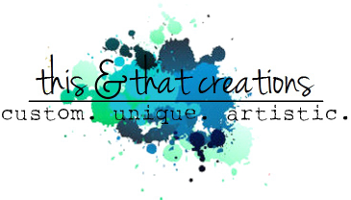 2005 This & That Creations specializes in custom designed wedding invitations, favors and more.